As the year comes to an end - the fifth year of this project - I wanted to squeeze one more posting in. 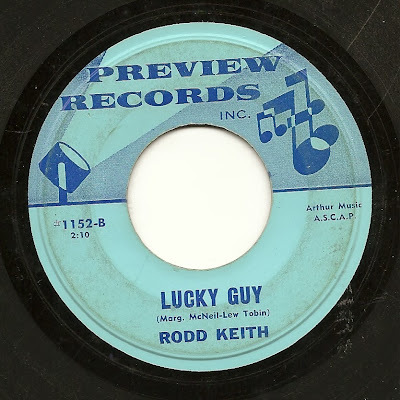 No time for typing, got a party to host, just wanted to offer up a decent Rodd Keith offering, with the ironic title of "Lucky Guy" - based on the lyric, the protagonist thinks that's far from an accurate description for his life situation. Have a listen. What U.S. company's name is more synonymous with Christmas than Hallmark? With their ornaments, commercials, decorations, TV specials, etc. etc., they could be called The Christmas People. I'll leave it to each of you to decide how good or bad a thing that is. 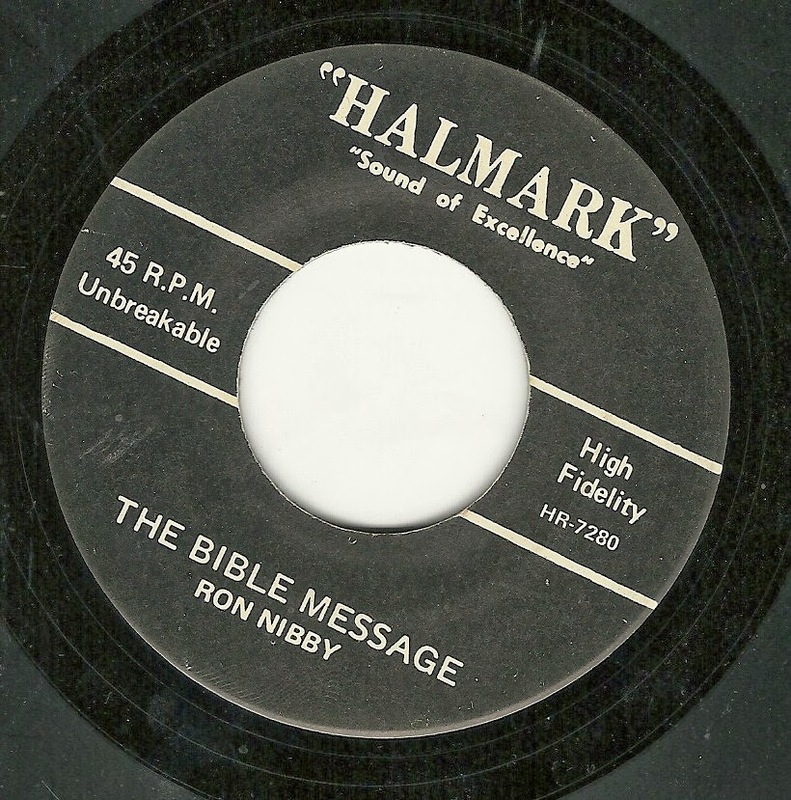 In honor of the Hallmark people, for Christmas Eve, here is their near-namesake company, The Halmark Records label, and two Christ-tastic offerings. On one side, heard below, you can hear about "The Christmas Message", in a typically stultifying arrangement and performance. 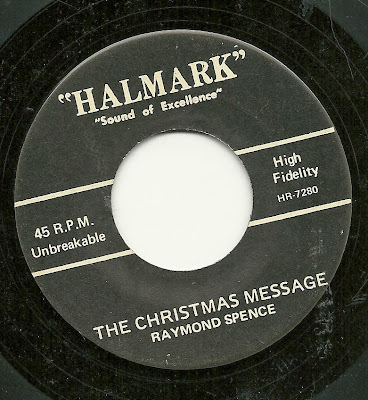 Interestingly, just this month I received an MP3 in e-mail, of another Halmark number, titled "A Christmas Dream", set to the same backing track, and featuring what sounds like the same singer. This one, if anything, is even worse than "Christmas Dream", although it's a close race. 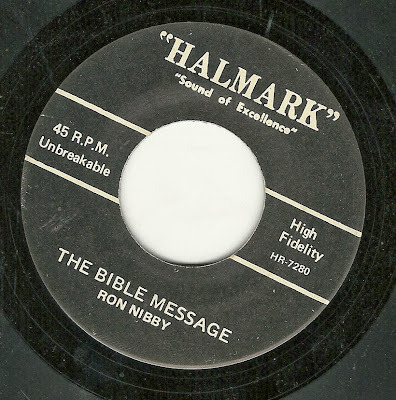 If you're still awake, you can reward yourself with the wonders of "The Bible Message". Not content to stop the proceedings, with a spoken word passage (as they so often did), this vocal performance contained on this "song" features nothing but narration, a sort of "God's Greatest Hits", tripping lightly through a series of generic summing ups bible stories, focusing primarily on the story of Jesus. All in all, the ideal music for the opening of presents, whether your tradition starts as the sun goes down tonight, or as the sun comes up tomorrow. A Very Happy Christmas to One and All!!! As we ramp up to Christmas, here's another song for the season. This is an early Sterling Records release, early enough that Lew Tobin was still taking primary credit for the performance, above the singer (this is record #318 - by the mid 300's, he had discontinued this practice). But the focus really should be on my main man, Norm Burns (or, as credited here, Norman Burns). 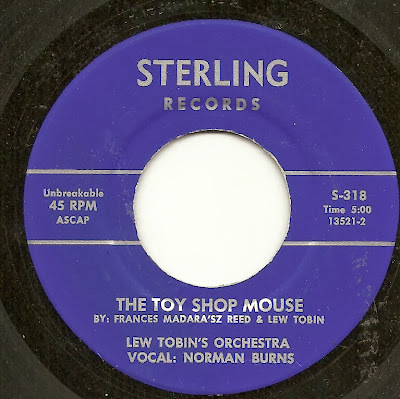 I wish I could report that this record, "The Toy Shop Mouse", was the sort that could have found its way into the hearts of millions, if only given the chance, and competed for time on Christmas radio stations, mall programming, and perhaps even TV viewers to its animated special. But it's not that sort. It's fairly tedious. The story is told in minute detail, over nearly five minutes, building up to a punchline that was no doubt supposed to be heartwarming, but actually just captures a mice-related annoyance. Still, it is Christmassy, takes place in Santa's workshop, and concludes with Santa's ride on Christmas Eve, AND Norm sings it, so it can't be all bad! The flip side of the record also features Lew and Norman, in a story of prospecting "Way Out in Arizona". The melody hews dangerously close to "This Land is Your Land" at times, which I guess is not wholly inappropriate, given the focus on one part of that Land. I generally love the reverb on these Sterling records anyway, and I really like the way that the reverb here makes the drumbeat echo so much as to sound like a chugging train. On the other hand, a close listen to the lyrics will demonstrate that there is no story here - the writer introduces us to a prospector, then, for the rest of the lyric, tells us how great Arizona is, and how much he'd like to be there. Just when time pressures looked to keep me from having the time to record, improve the sound as necessary and scan, from out of the ether of the internet (or perhaps it's a series of tubes - I've heard that's what it is), came an wonderful two sided hit produced by our friends at Film City. 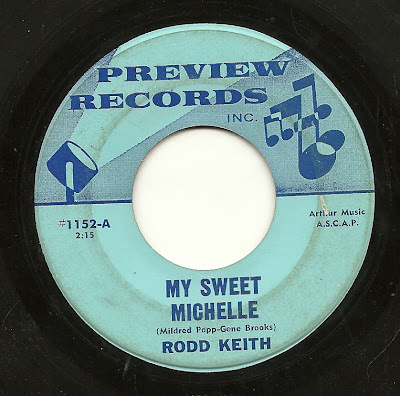 Since this was offered up by a correspondent, and is not from my collection, I don't have label scans, but I think the material itself will prove its worth. And I'll leave it to each of you to determine if you deem this a song-poem. As it is sung by a child, and written by another person with the same last name, it seems likely that this was written by the singer's parent, or at least a family member, and then produced by the fine folks at Film City, in what seems to have been one of their last releases (#4091, in a series that is not known to have run beyond #4200, to my knowledge). So was it a song-poem in the sense that someone at Film City wrote the music, or is it not so much, in that perhaps they only arranged the backing for a song which was already fully written? There's really no way to tell, I suppose. Both sides are quite well done, but while one song is better suited for today (being a Christmas song), I'm going to lead to the one I much prefer, which would be a better fit in two weeks, given that it's a look back at a year which is about to end. 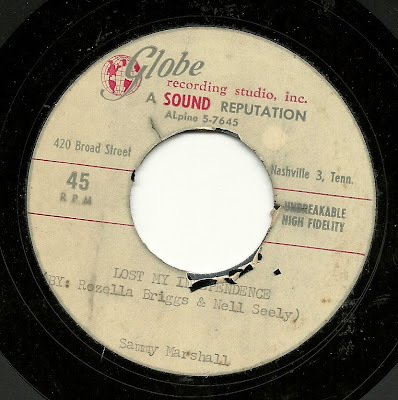 The flip side, "Oh Dear Santa Claus", is bittersweet, and more than a bit maudlin, but still most excellent in arrangement and performance. Last Christmas was great, but daddy's has left the family in the time since, and all she wants is for him to return. Again, the wizardry on the Chamberlin stands out here. This is another one of those weeks when time is exceptionally short around our place, so I'm not going to go into any great detail about today's offering. 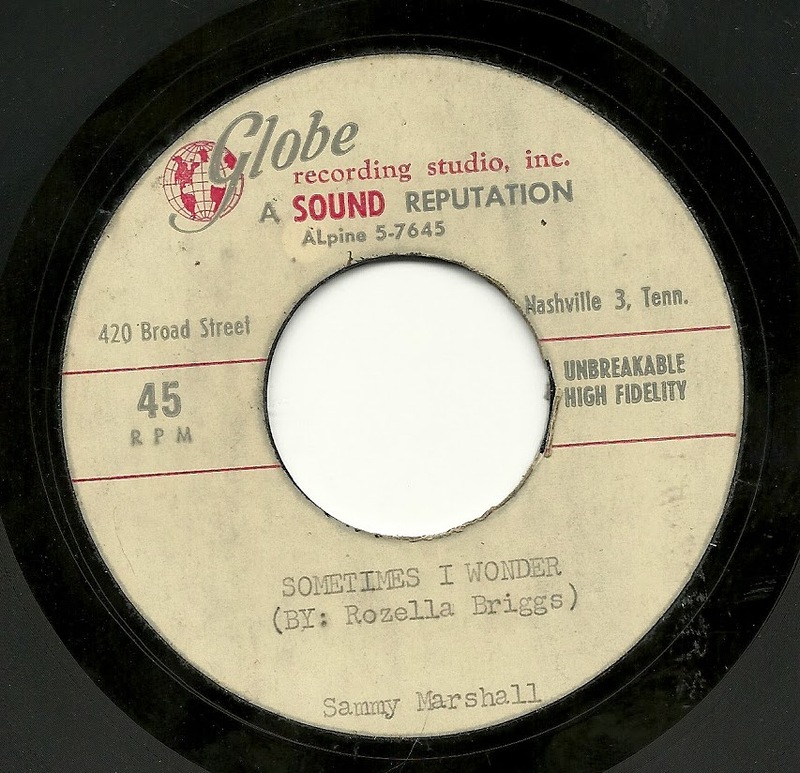 Suffice it to say that it is not a song-poem release, but a demo on the Globe label, sent to the customer, most likely to encourage her to pay for the full band treatment.